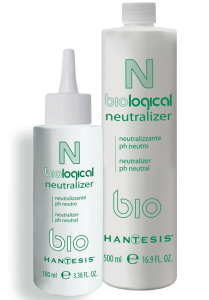 Biological solution unique strength for a Double Service Waving & Straightening action for all kinks of hair. BIOLOGICAL PERM, biological perm unique strength. It contains SOY PROTEIN, nutrient for the hair structure; KERATIN AMINO ACIDS, coming from the same hair protein and MARINE COLLAGEN AMINO ACIDS with internal hydrating effect, they increase the hair elasticity, prevent split ends and they are a perfect restructuring elements for damaged hair. Amonia free and thiglycolic acid free. Scented spray for perm. It contains an active principle that captures and complexes the odorousnbmolecules turned into inactive products. In this way, they are not perceived anymore by our olfactory system. Gelling Milk is an additive for Biological Perm. It has a volumizing and straightening action. It contains hydrolysed keratin that nourishes and gives body to dry and weak hair.